The 3-D Sports Bounce House has an over sized inflated baseball, glove and bat covering one front post, and a football, basketball and soccer ball on the other side, this bounce house invites children into a fantastic sports jumping world. Bold colors plus black and white referee stripes further contribute to the fun, sporty theme. 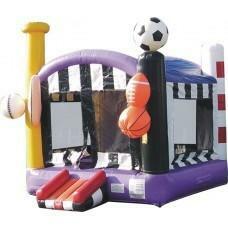 The fun doesn't stop on the outside of this jumper though; inside children will enjoy playing hoops with the built in basketball hoop(basketballs not included) The 3-D Sports Bounce House always scores a home run.